This Edition’s Bookish Addiction? 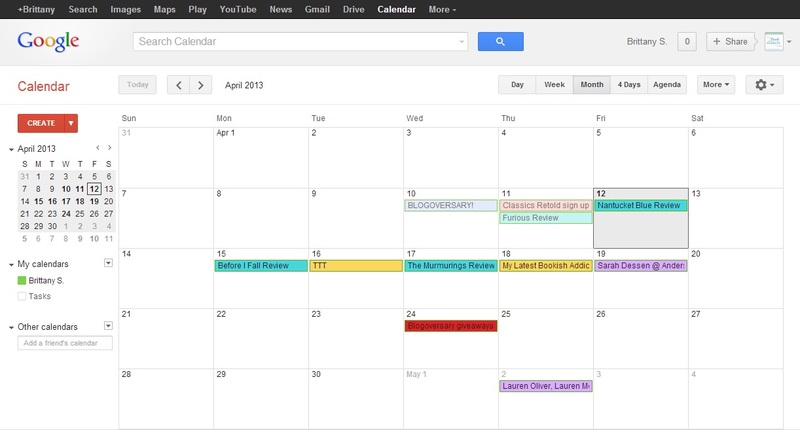 Google Calendar + scheduling. Okay, so Google Calendar doesn’t exactly scream “book nerd” but from the Twitter conversations I had after announcing I almost forgot to read a book for a blog tour (*GASP*), clearly it’s close to being a blogger-must! I wrote this book tour down in my good, old-fashioned paper planner. I love my planner! I feel all organized and keep it in my purse, carrying it with me everywhere. The only problem? I never cracked it open again. That fun little planner (which screams regular nerd) just sits in there and I barely sneak a peek at what I have coming up. PROBLEM. I threw it out there in the Twitter-verse that I need to start using Google Calendar to schedule my big events and reminders, and the responses that I got were surprising! It sounds like a lot of us bloggers have started to use Google’s calendar feature to keep out schedules from getting away from us! I knew that I had this blog tour hanging out there, but I wasn’t exactly sure when it was. Then I realized I need to do an interview for it. And I still haven’t read the book for it. Then I panicked and decided to start my Google scheduling ASAP! As an organization aficionado, Google Calendar makes it easy to keep all your different posts or commitments separated by color coding (Ooooh, ahhhh), so I chose to use a different color depending on what I have scheduled or what the post/event actually is. The only thing that’s missing that I can do in my paper planner versus Google Calendar is a little notes field where I can write whatever and not have it be on the actual calendar. I would love just a tiny spot to type in something for books I need to read soon, but I guess I can always make yet another Goodreads shelf for that…. But that’s a whole different topic all together! Do you guys use any scheduling for your blog? Aside from scheduling posts in advance, do you have to use calendars to keep from forgetting? Have you started obsessing with Google Calendars like I have? This entry was posted in Books and tagged Books, Discussion, Google, My Latest Bookish Addiction on April 18, 2013 by Brittany.